The UPP can’t represent this group of people, because it doesn’t exist. 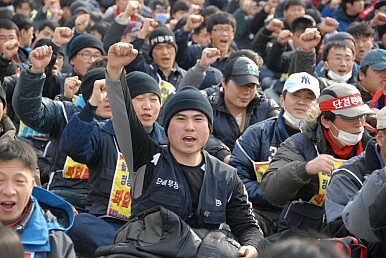 NPAD appears more concerned with the illusive concept of party “innovation” and “struggle” against the Park Geun-hye administration. Why not actually represent someone, like labor unions or the poor, or both? Why not actually stand for something, like providing social protections for labor market outsiders? But to do so presumes that the party is actually capable of putting forth a “predictable, stable left wing programmatic platform” — something Christopher Green doesn’t think exists in the South Korean context. Wong would agree. The problem, it seems, is that South Korea’s party system has failed to institutionalize: “Partisan affiliations among voters and the parties’ rank and file are capricious and ephemeral.” The parties “are viewed as transitory, rather than institutionally entrenched or relatively fixed points on programmatic or ideological partisan spectrums.” Whether this actually applies to the ruling conservative party (Saenuri) is debatable. What is indisputable, though, is that while business interests are more than capable of taking care of business, so to speak, those with less “power resources” (e.g., the poor and labor market outsiders) are not. So perhaps the question shouldn’t be “who does the left represent today?” It should be “why doesn’t the left represent those who most need representation?” Seems like as good a place as any to build a programmatic party platform. Is South Korea's Liberal Opposition Party About to Split? Rumors of a new party forming in the NPAD's traditional stronghold continue to swirl.